Digital 5 A Day is a framework to help children get the most from their time online and to balance digital activity with overall wellbeing. Digital 5 A Day is a tool for parents, carers and others working with young people to use in framing discussion about social media use and broader digital citizenship. In this blog post teacher, Dave Presky, reflects on how Digital 5 A Day can be applied in the classroom. Dave has also created a presentation for schools showing more examples from his work and how they link to different areas of the primary curriculum. Dave Presky is a Head of computing and a Specialist Leader of Education for Computing and E-Safety; he was formerly the Computing teacher at Little Reddings Primary School (Bushey St. James Trust) working with Foundation Stage, Key 1 and Key Stage 2. 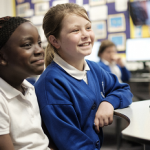 As a primary school teacher who specialises in Computing and E Safety, I listened with great interest as Anne Longfield, the Children’s Commissioner for England, explained her ‘Digital 5 a Day’ concept. Her new initiative, encouraging children and parents to develop a balanced and positive digital lifestyle, is refreshing. 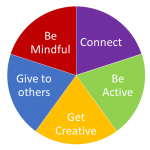 As someone who works alongside families to help children manage their online lives, the new Digital 5 A Day framework is very helpful in supporting action and conversation around internet use! 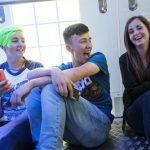 During this academic year, my school developed its own research project looking at the impact of screen time and sleep deprivation on pupils. Our findings clearly indicate the need for a positive approach to the supervision of our children’s online use, with many parents lacking the confidence to effectively manage children’s online activity. Below, I have provided some examples of how the new ‘Digital 5 A Day’ framework can help children take ownership of their online lives, whilst encouraging adults to consider the benefits of the internet! When used constructively, online connectivity can be a hugely positive experience for children. Giving students access to safe Virtual Learning Environments (VLE) is something schools can do to effectively introduce the internet to young children. Exploring a monitored environment such as this, can encourage pupils to develop positive online behaviours and provide a strong foundation to build on. With the rising popularity of iPhones, tablets and computers, many parents are becoming increasingly concerned that their children are spending less and less time enjoying outdoor, physical activity. Indeed, as a school, we have been thanked on numerous occasions for providing pupils with extracurricular activities that keep children away from their screens. However, it is important to recognise that the internet can provide fantastic opportunities to get active and moving! Creating iMovie films on location, gathering images from around the school to stimulate writing, or creating Book Creator presentations from a school trip, are all great ways of using the digital tools to explore the real world. As adults we lead busy lives, so we are not always best placed to appreciate the incredible creative possibilities often freely available in the evolving digital world. Using the internet to develop creativity can help spark new interests and provide great family fun! Free, or inexpensive apps (such as Garage Band and iMovie) can give children and parents access to fantastic opportunities. A family at our school used internet sites such as Youtube to help develop hobbies including cooking. Online resources have been used by my students to self-teach a multitude of new digital and non-digital skills (both curriculum and non-curriculum based). ‘Giving to others’ online is a powerful way of demonstrating what a helpful and inclusive place the internet can be. Using our school’s VLE we explored online forums, setting up different discussion spaces to give our students a place to consider and support each other. Students across Years 3 to 5 were encouraged to post concerns, with Year 6 children able to respond with positive advice. Topics discussed included how to deal with cyber bullying, stranger danger, hacking and password security. This idea was expanded to develop Digital Citizenship, with students working collaboratively to create an online newspaper about the school. Experiencing the internet as a positive force for good, can help pupils develop an understanding of the internet as a fun, social space. When undertaking our own research, we found it easiest to engage with parents and children with older siblings. Families with older siblings were more likely to have experienced the negative impact of an unbalanced digital lifestyle. In our study, one older sibling, who was taking her GCSEs, reported struggling with the impact of social media. She explained that the impact of social media’s ‘group voice’ had made her very depressed. When approaching her GCSEs she would get ‘wound up’ by all her friends’ collective online stress. By becoming mindful and limiting her own screen time and choice of online use, she limited the external pressure. Taken together, I think the Digital 5 A Day can make a really positive difference to children, parents and schools. My own school has shown that there are loads of opportunities for improving children’s digital lives and I hope that Digital 5 A Day will encourage more schools to do the same.